MANY CUSTOMERS USE VOICE SERVICES LESS INTENSELY THAN DATA. HOWEVER, WHEN ACTUALLY TAKING OR PLACING A PHONE CALL, THEY EXPECT RELIABLE CONNECTIONS. HOW DO THE DUTCH MOBILE NETWORKS MANAGE TO FULLFIL THESE EXPECTATIONS? All three operators in the Netherlands support Voice over LTE (VoLTE). VoLTE transmits voice calls as data packets over a 4G connection. This way, the otherwise necessary “circuit-switched fallback“, which forces smartphones to switch back to 3G in order to take or place a phone call, can be avoided. Also, VoLTE supports better audio codecs providing operators with the opportunity to deliver higher speech quality to their customers. For the voice rating, each drivetest car and each walktest team carried one Samsung Galaxy S9 smartphone per operator. The phones in the cars called a counterpart in one of the other cars. The phones carried by the walktest teams called a stationary counterpart. 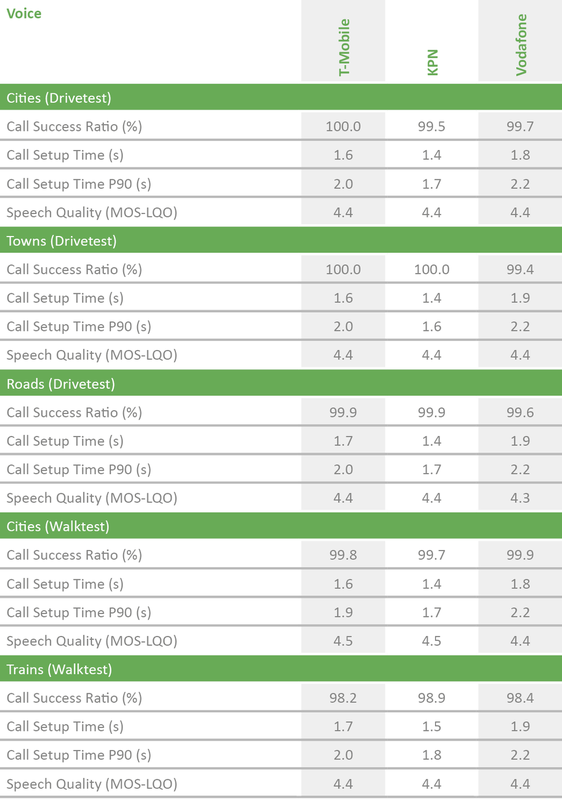 The connected testing equipment regis­tered success ratios, call setup times and speech quality. In order to simulate normal smartphone usage, data transfers took place in the background of the test calls. In the voice drivetests conducted in 21 Dutch cities, T-Mobile achieves the highest score, with KPN and Vodafone following closely. All three offer the same high speech quality to their customers. T-Mobile’ owes its narrow lead to a call success ratio of 100 per cent, but with 99.5 and 99.7 per cent, KPN and Vodafone score only marginally behind. the drivetests. However, call success were slightly better in the Vodafone network. So, while all resulting KPIs range on a very high level, in the assessment of this partial discipline Vodafone is slightly ahead of the competition. In the voice results of the drivetests conducted in 31 Dutch towns, T-Mobile and KPN lead the field, while Vodafone follows at a close distance. As in the larger cities, again slightly higher success rates ultimately decide the lead in this cate­gory. While T-Mobile and KPN succeed in 100 per cent of the call attempts, Vodafone achieved a still very good 99.4 per cent. When it comes to conducting voice calls on the roads, T-Mobile and KPN are again in the lead, Vodafone ranks third. While the KPIs minimally drop in this more demanding category, they are still on a very high level. T-Mobile and KPN achieve a high call success ratio of 99.9, while Vodafone follows at a close distance with a very good 99.6 per cent. Since the previous year, walktests conducted while travelling on trains are part of the P3 connect Mobile Benchmark Netherlands. In direct comparison, all three Dutch operators score slightly lower in this discipline than last year. There are a number of possible explanations: This year’s test routes are different from those of the previous year. More travelling mobile users might put addi­tional stress on the networks. And/or newer train types have a higher attenuation for mobile phone signals. However, given the challenging environment of railway waggons, all three ope­rators still achieve good results. KPN is slightly ahead due to a call success ratio of 98.9 per cent. T-­Mobile and Vodafone score on practically the same level. Overall, the results on Dutch trains still clearly outperform those of other European countries such as Germany or the UK. THE VOLUME OF TRANSMITTED DATA IS GROWING RAPIDLY, WHICH EMPHASISES THE IMPORTANCE OF DATA CONNECTI­VITY. WHICH OPERATOR IN THE NETHERLANDS MANAGES BEST TO KEEP UP WITH THE INCREASING DEMAND? Data connectivity is the most prestigious discipline in our benchmark and also in the operators’ marketing. All three Dutch networks claim to cover a large part of the population with LTE services – the claimed percen­­ta­ges all range in the high nineties. And all three operators are continuing to spend large sums on upgrading and expanding their networks to meet the growing demand – including the installation of early 5G network cells. Today, the Dutch operators have equipped their 4G networks to offer the combination of four or even five LTE carriers in different frequen­cy bands. This “carrier aggregation” is the tech­nical basis for the so-called “4G+” services which theo­re­tically support data rates up 1 Gbps. The Samsung Galaxy S9, which we used for the measurements, is a so-called LTE cate­gory 18 device and can generally benefit from carrier aggregation with download speeds up to 1.2 Gpbs. However, T-Mobile and Vodafone use specific carrier combina­tions that were not fully supported by the Galaxy S9 with Android Oreo which was used at the time of testing. Users of these networks who upgrade to the latest Android OS version might enjoy even higher data rates. In general, users looking for the fastest pos­sible data rates, should ask their operator for specific device and firmware recommendations. The benchmarking of web-page downloads as well as file downloads and uploads rewards fast data rates. 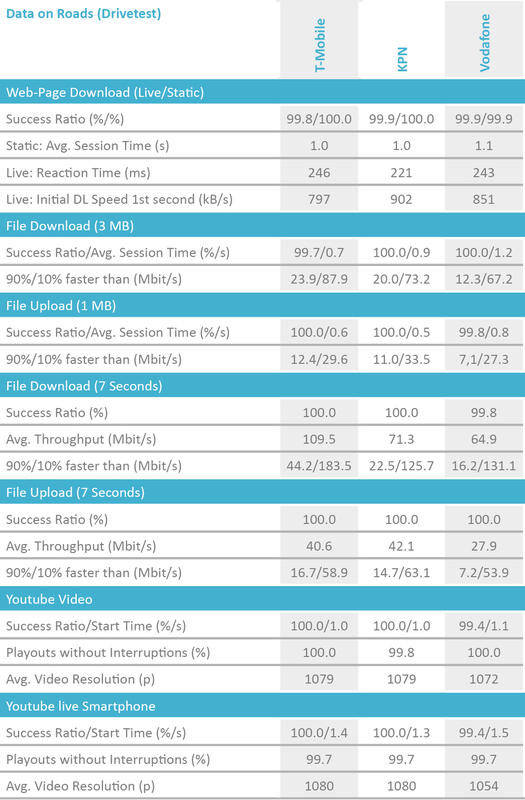 Peak data performance was tested in uplink and downlink directions by assessing the amount of data that was transferred within a seven seconds time period. In order to support higher throughputs, these measurements have been conducted with three TCP sockets (see methodology section for more details) At the same time, P3 assesses the networks‘ availability and stability by examining success ratios. Above that, we determined the minimum data rates that are available in 90 per cent of the cases plus the peak data rates that would be surpassed in 10 per cent of the cases. YouTube evaluations concentrate on success ratios, start times and playouts without interruptions as well as the received average video resolution. 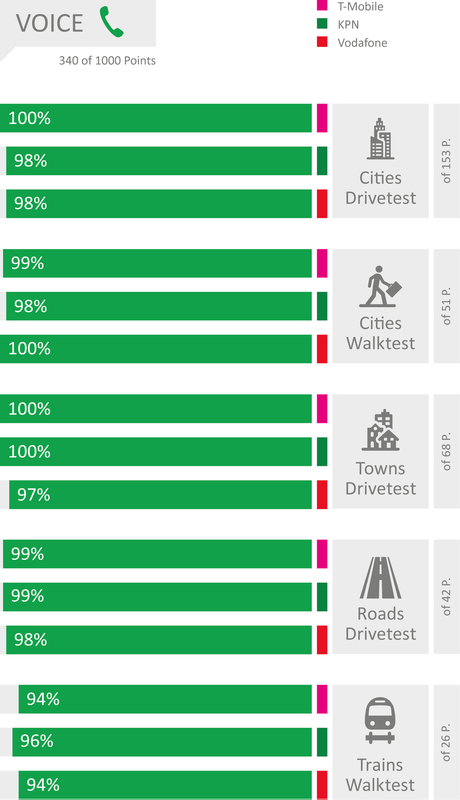 As in the voice discipline, T-Mobile also takes a narrow lead in the big city data drivetests. The determined success ratios are all at 100 per cent or very close to that. KPN and Vodafone score behind at a very narrow distance and are practically on par in this discipline. A detailed look into the measurement protocols shows that KPN has the highest share of 4CA – over 30 per cent. Vodafone’s 4CA share is slightly above 10 per cent, but provides the widest bandwidth (60 MHz). As explained before, the Galaxy S9 used for our Benchmark did not fully support all frequency combinations in the T-Mobile and Vodafone networks. In the data results of the walktests that were conducted in seven large Dutch cities, Vodafone takes the lead with even slightly higher success ratios and data rates than the also very strong T-­Mobile. Still, both operators perform on a phenomenally high level. KPN shows also very good results, but in this discipline the largest Dutch ope­rator falls a little more distinctly behind its competitors – particularly due to slightly lower success ratios and partially slower data rates in some of the test cases. T-Mobile takes the lead. In this partial discipline, KPN ranks second and Vodafone third. However, Vodafone impresses with similarly high success ratios as T-Mobile, while KPN shows slightly more dropped data connections, but on the other hand higher data rates. Drivers who travel on Dutch roads can expect a very high quality of connectivity. T-Mobile and KPN together lead in this discipline achieving high success ratios and fast data troughputs. Vodafone also performs very well in this discipline, scoring only slightly behind its two competitors. As already mentioned in the voice category, this year’s results of the measurements in trains falls a little behind those of the previous year. In this discipline, T-Mobile clearly scores best, KPN ranks second and Vodafone third. Compared to other countries, the Dutch operators perform very well, but especially in the data category, there is still room for improvement.